This ride is completely unpaved, gravel roads. Apart from the avalanches up high, they aren’t too bad …. 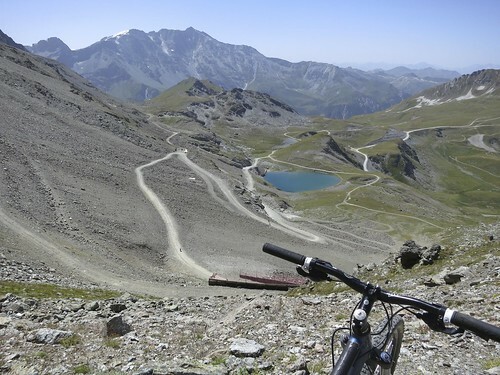 but require a mountain bike. 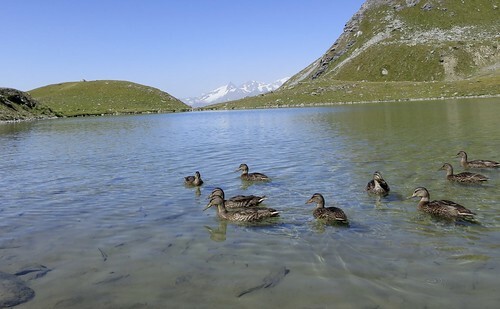 Les Arcs is one of our favourite French high Alps ski stations. The high point is Aguille Rouge at over 3200 metres. I am terrified the few times I have skied down …. but always thought it might be a great cycling goal. So I finally decided to give it a try. 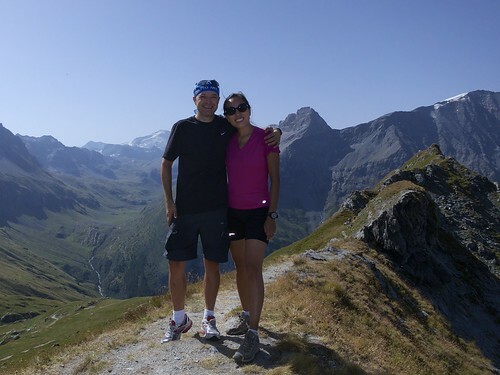 My brave wife joined me for the preliminary part of the ride, up to Col de Chal. 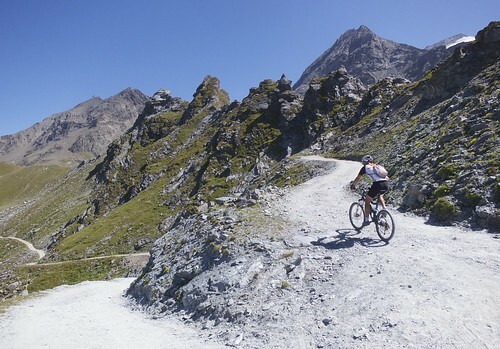 (see here for a huge ride up the other side of Col de Chal). The last stretches are steep. Very well done. At this point we split up, Doreen to explore, and me to try and get high. From Les Arcs 2000 is a cable car that goes to Aguille Rouge, above 3200 metres. 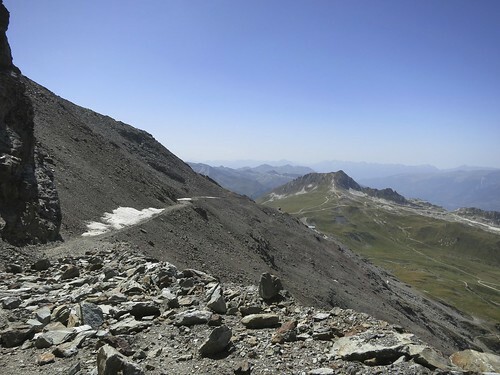 It has a stop half way called “Varet” at roughly 2600 metres. My first goal was to head up the road to this mid-station. 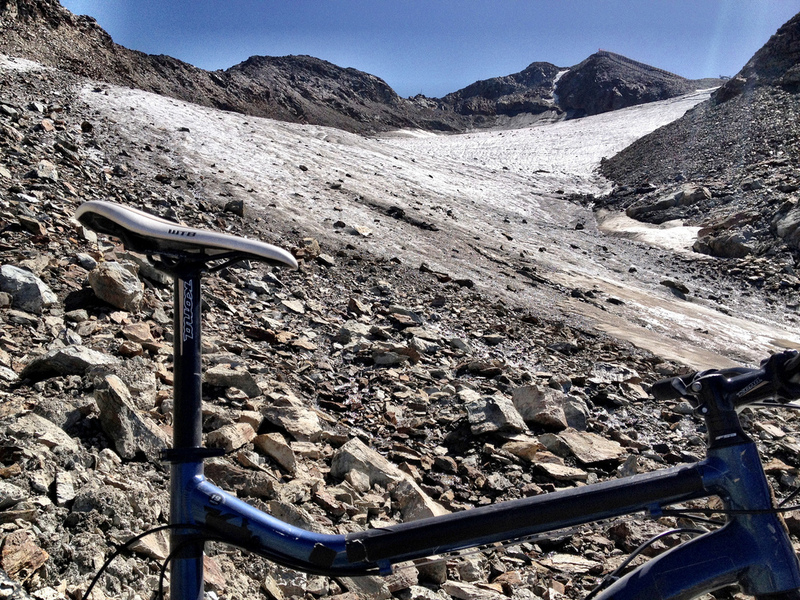 At perhaps just below 2900 metres I made it to the Glacier du Varet. I spent some time inspecting, and hiked a little higher. All the rocks in the photo were over pure ice, there was no road I could see, it was crazy steep, and finally I decided there was no sensible way to continue (with a bike). Still, the second highest I have been with a bicycle. I could have perhaps descended to the north – it was my original plan. But it was signed as a black ski piste and I was a little nervous it would be too crazy so I back-tracked as it was getting late. Probably a good decision, but if anyone knows the route, I’d love to hear their thoughts. 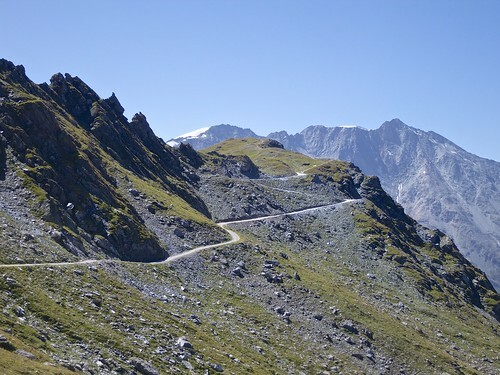 For a road bike climb to other Glaciers 1) the Rhone Glacier — see here. 2) Glacier de Mont-de-Lans — see here. 3) Glacier de St. Sorlin — see here.